How one man’s dream became a thriving company with a £22 million annual turnover. 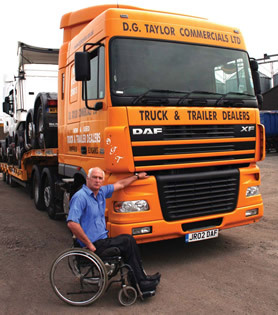 DG Taylor Commercial Vehicles Ltd was established in 1978, to provide customers with high-quality used commercial vehicles. Since then, we’ve grown in size and now have a team of 12 staff plus a large inventory of vehicles and are one of the UK’s most trusted commercial vehicle dealers. David Taylor’s love affair with commercial vehicles started over 50 years ago. At the age of 12 his father, who worked as a vehicle distributor driver and fitter, started taking him in trucks alongside him and by the time David was 15, the love affair was in full swing. When David left Burnley Grammar School he delighted in telling everyone that he was going to work in the truck industry. This he achieved, not as a vehicle fitter but as a trainee management salesman. David remained at the company for three years until he was asked by the company chairman to join the company’s Hull depot, which was the largest distributor of vehicles in the country selling all British Leyland products. By the age of 23 David had established himself on the sales team and was selling as many vehicles as some of the senior salesmen. But then on a fateful night in September 1969 tragedy struck. Laying in a hospital bed many weeks later, David was told by the specialists his career was over, he wouldn’t walk again and that he ought to be making plans to be looked after for the rest of his life. Fortunately, David’s employer had total faith in him and left his job open to see if he could manage it. In order to achieve this, David moved to a ground floor flat, relocated to a ground floor office and bought a car fitted with automatic transmission and hand controls. He still vividly remembers going into his new office with great trepidation, but on the desk was a letter addressed to him and, when he opened it, inside was an order for six new Leyland chassis/cabs. From then on there was no stopping him and David remembers how it must have been quite novel; a young man in a wheelchair going into companies selling HGV trucks! Three years later, aged 26, David was appointed general sales manager, looking after a sales team of six, who managed to sell more Leyland trucks year-on-year than any other distributor in the country. With ambition still burning inside, David wanted to have his own company and in 1978 DG Taylor Commercial Vehicles Ltd was born. In the first month of business David went to see as many people as possible to drum up interest. One was prepared to rent him a yard – now the 5-acre premises owned by the company – while another sold David a spare car on easy terms. There were many ups and down in the first ten years, both business-wise and in life itself. One real personal highlight for David was being selected for the Great Britain Paralympics sledgeracing team at the 1984 Innsbruck games, and also playing ice hockey for Great Britain. David eventually retired from sport in order to focus more time on his now small but thriving company, retailing used vehicles and new and used tipping trailers. It was at this time that David began to think about he would manage if he had to take time away from the business due to his paraplegia, so he bought some S/H tractor units, tidied them up and found customers to hire them. This was the birth of the contract hire division, which is now about 200-strong, with most new DAFs purchased from David’s previous employer.